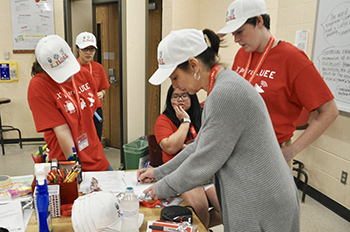 A new world of opportunity is opening up for sixteen 7th and 8th grade girls from the southeast Texas area, as they explore principles of engineering and robotics at Lamar University’s third annual X-plore LUEE summer camp. 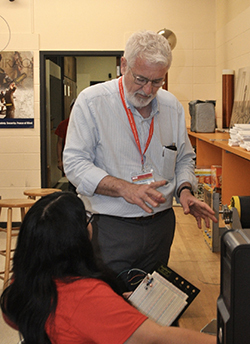 The camp, hosted this week by the Phillip M. Drayer Department of Electrical Engineering, was created “with the purpose of getting middle school girls interested in electrical engineering” according to the camp creator Harley Myler, professor and chair of the department. The four-day camp is filled to the brim with different topics and activities giving the girls a hands-on learning experience with electrical engineering. Each day participants explore a different concentration including electrostatics and electromagnetics, telecommunications and logic circuits, computer programming and robotics, said Karen Glenn, a robotics teacher from Lumberton middle school who is acting as an e-teacher and facilitator for the girls throughout the day. 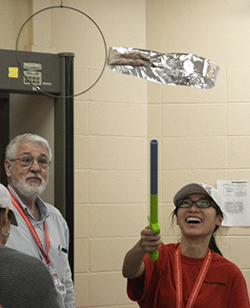 Tuesday’s hands-on activity included something called, “fly stickers, or fly sticks, it’s just for them to have fun, and … it’s a form of electrostatics,” senior electrical engineering student Ngoc Tran said. According to the Office of the Chief Economist, women made up 47 percent of all U.S. jobs in 2015, but only 24 percent of STEM jobs, and within STEM only 14 percent t of all engineering jobs were held by women from 2009 to 2015. It was noted that women with STEM jobs earned 35 percent more than women with comparable non-STEM jobs. And that the gender wage gap is smaller in STEM jobs than non-STEM jobs. On Friday afternoon, parents are invited to see what the girls have been doing and the X-plorers will finish the camp by racing their robots at 2 p.m. in the Cherry Engineering building. For more information on future programs with X-plore LUEE please contact Courtney Arnold, administrative associate at carnold4@lamar.edu.